The vice president of the All Ceylon Tamil Congress, Mr. S.Shanmuganathan, presided. In his speech, Mr.Sampanthan said that Mr. Chelvanayakam made the Thamileelam declaration in the 1976 Vaddukoddai convention, after having failed to find a political solution through talks with Sinhala political leadership of the country over several years. “Mr. Chelvanayakam opposed the division of the country at that time and wanted a political solution to the Tamil national question under a federal concept. However, Thanthai Chelva was disillusioned with the policy of the Sinhala political leadership, as it did not take seriously the demands of the Tamil people of this country,” Mr.Sampanthan added. 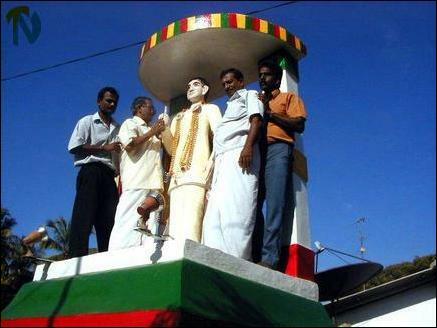 Parliamentarian Mr.Thurairatnasingham seen garlanding Thanthai Chelva statue. Thanthai Chelva had said that the Sinhalese political leadership lacked maturity and responsibility. In the debate on Indian Citizenship Act brought by the then Prime Minister Mr.D.S.Senanayake, Mr. Chelvanayakam made a speech analyzing the true intention of the Sinhalese leadership. Thanthai Chelva had said actions and thinking of the majority community leaders, far from uniting people, would lead to the division of the country, Mr.Sampanthan pointed out. “We witnessed in the recent Speaker’s election that the thinking of the Sinhalese political leadership has not changed for the better. Even now Sinhala leadership has not achieved maturity and has failed to understand the aspirations of Tamils,” said Mr.Sampanthan. 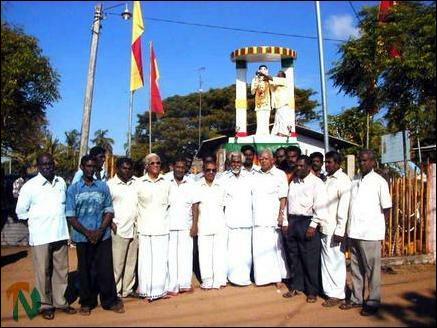 Parliamentarians R.Sampanthan, K.Thurairetnasingham are seen in front of the Thanthai Chelva statue with party activists after paying homage to late Tamil leader, SJV. Chelvanayagam. “Sinhala political leaders should come forward to find a political solution to the Tamil national question through negotiation. We would be forced to think of regaining our lost sovereignty if the Sinhala political leadership did not come forward to find a settlement through talks,” Mr.Sampanthan stressed. The Trincomalee district parliamentarian, Mr.K.Thurairatnasingham, former Urban Councilor Mr. R.Somasuntharam and Mr.S.Jesuthasan also spoke. Trincomalee Sivankoviladi Youth Front organized this event. In the morning Messrs R.Sampanthan and K.Thurairetnasingham with party activists paid homage to the late Tamil leader by garlanding his statue. Later in the evening the SYF organized a sports festival. In the tug-of-war competition seven teams, including a team from the Uppuveli Police in Trincomalee participated. The SYF President, Mr.Subra Selvarasa introduced Mr.Sampanthan and Mr.Thurairetasingham to the police and other teams. 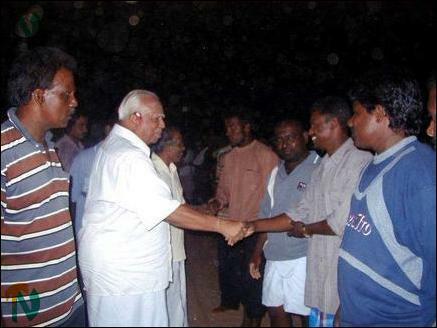 Messrs Sampanthan and Thurairatnasingham are being introduced to the Thirukadaloor tug-of-war team. 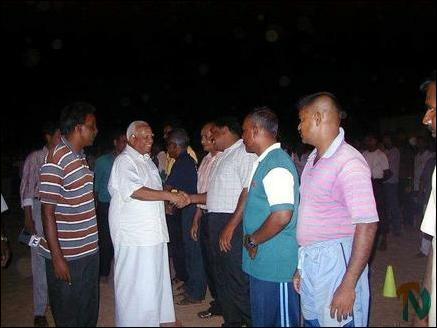 Mr.Sampanthan being introduced to Uppuveli Police tug-of-war team.